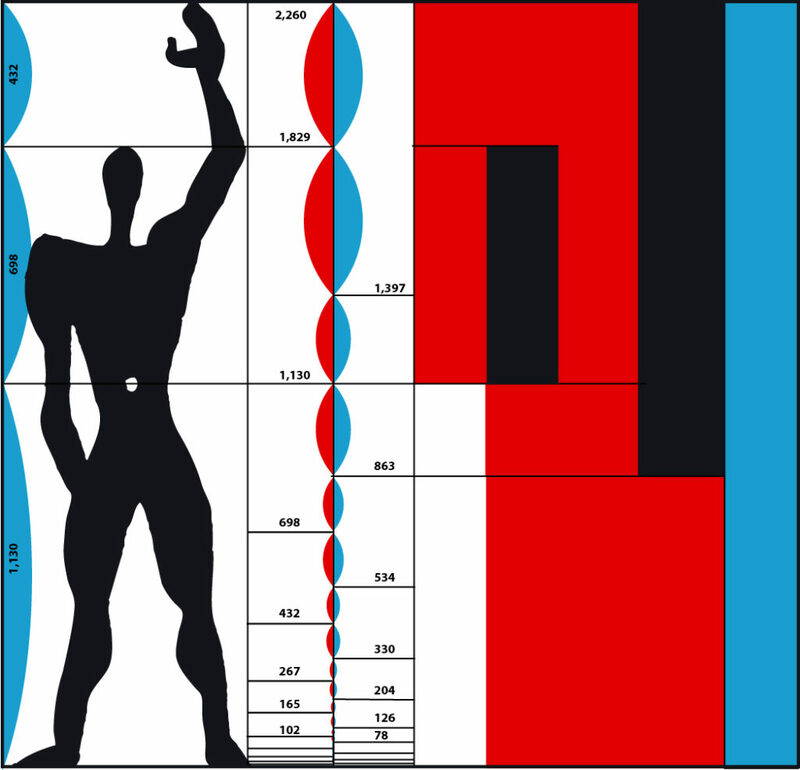 The Modulor is a universal, anthropometric scale of proportions created by the Swiss-born French architect Le Corbusier and devised to measure and reconcile maths, the human form, architecture and beauty into a single system. 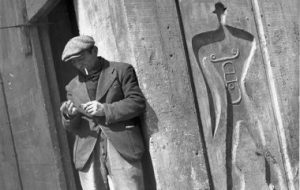 Right after the Second World war ended, Le Corbusier began to think about a way to unite two virtually incompatible systems: the Anglo-Saxon foot and inch and the French metric system, with a universal scale. During this time, he devised the first bases of the “Modulor”, a scale of harmonic measures that set architectural elements in proportion to human stature. Initially, the Modulor man’s height was based on a French man’s height of 1,75 meters, but it was then changed to 1.83 m in 1946. The dimensions were subsequently refined to give round numbers, and in 1950 the theory was finally perfected and the overall height of the human model with its arm raised was set at 2.262 m.
The Modulor, Le Corbusier, 1946. 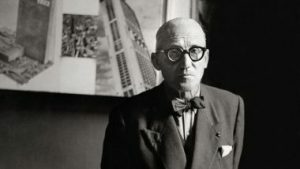 Charles-Édouard Jeanneret-Gris, better known as Le Corbusier. Developing the Modulor, Le Corbusier was inspired by the long tradition of Vitruvius, the works of Leonardo da Vinci, Leon Battista Alberti and by other attempts to discover mathematical rhythms in the human bodies. He was also fascinated by the ancient civilisations who used measuring systems based on the human body whilst he was quite troubled by the metre as dependent from a scale as the Earth’s meridians. Vitruvian Man by Leonardo da Vinci, circa 1487; one of the inspirations for the Modulor. Le Corbusier’s intention was to develop a scale which could improve both the appearance and function of architecture by solely using human proportions, the double unit, the Fibonacci numbers and the golden ratio. He aimed to design a visual bridge between two incompatible scales, the imperial system and the metric one, that could reconcile mankind, architecture and nature. Le Corbusier stands with a concrete gliph of Modulor Man. The Modulor system is based on the height of a man with his arms raised, that is a height of 2.262 m. It was used by Le Corbusier in a number of buildings, before getting codified into two books: Le Modulor and Modulor 2. The architect suggests that the system could be used to provide the measurements of all aspects of design: from door handles to cities, from industry to mechanics. Carpenter Center for the Visual Arts, built in the United States. 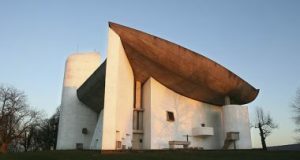 Notre-Dame du Haut, a church built by Le Corbusier using the scale of the Modulor. Although the Modulor was blatantly successful at the time, several criticisms were made of the system. First of all, the height of the human figure appeared to be far too arbitrary and more likely chosen to be mathematically convenient. In fact, it didn’t take into account the height diversity of men, and the average user would probably be constraint to rely on the scale in more complex and artificial ways. Secondly, Robin Evans noted that the female body “was only belatedly considered and rejected as a source of proportional harmony”, during the works leading to the creation of the Modulor.